Looking for a creative spark? Thanks to the advent of paint and sip classes, your masterpiece is only a glass of wine away. In Arizona, we’ve got an abundance of studios that provide a space to unwind through painting, and a few glasses of wine. Here are the 10 best places for paint and wine in the state! Get your creative juices flowing at the Brush Bar. The Brush Bar is a Scottsdale company that offers instructional paint classes to go with their wine bar. You’ll be greeted with a canvas, brush, apron and free glass of wine upon entry. During a two plus hour course, you’ll sip wine and get step-by-step instructions by an artist on recreating iconic paintings. Armed with a relaxing vibe and helpful staff, the Brush Bar is the perfect spot for a creative night out. They even offer morning classes with mimosas for a morning spark. Pinot’s Palette is a high-energy art and wine studio. You can brush up on your painting skills at their evening classes every Thursday, Friday and Saturday night. Pinot’s large studio is packed with thirsty novices looking to paint their masterpiece. You’ll be guided stroke by stroke by an artist as you create your own rendition of classic paintings. Pinot’s provides a canvas, easel, brush, paint, and apron for each customer. You’re also free to bring your own wine, beer, and appetizers to this BYOB studio. Discover your inner artist at Creative Juice. Creative Juice offers a fun, music and wine filled course perfect for a date night or private event. Their classes include a two plus hour instructional painting session in a relaxed atmosphere. You’ll gear up with a paintbrush, stretched canvas, and acrylic paint before enjoying a beverage (or two) from the cash bar. This fun-filled studio also has themed nights, kid classes and workshops, and custom art classes where for personalized paintings. Downtown Phoenix’s arts district is located on Roosevelt Row. So it seems as natural a spot as any for The Painters Lounge. This paint and sip spot is located in a historical building in the middle of the arts district. At the Painters Lounge, you’ll be guided through a painting session while sipping on your favorite beverage. Though they don’t sell alcohol, you can bring your own unopened wine, beer, and snacks to their studio. The Painters Lounge also hosts special events throughout the year. You can paint your preference at their open sessions or follow along to their holiday themes during their Main Event sessions. Paint like a pro at Party with Paint. You’ll receive simple step-by-step instruction at this paint and wine destination. Set in a laid-back studio, Party with Paint gives you all the tools to create your own art masterpiece no matter your skill level. Students are also encouraged to bring their own wine at this BYOB studio. Paintings are pre-selected. However, Party with Paint encourages painters to request their own painting selections in advance. They even host paint your pet nights and walk-in classes for the ultimate personalized experience. Painting with a Twist is a national paint and sip company with over 300 locations across the country. Locals can try their hand at painting at two or three hour classes in their Tempe location. The courses are designed for every skill level to participate. You’ll get all the painting supplies and artist instruction to create your own work of art. Painters are also encouraged to bring their own bottle of wine for a little liquid inspiration at this BYOB studio. Why do locals love Uptown Art? For one, they’re offer affordable painting instruction seven nights per week. In fact, they even have $20 paint and sip classes every Tuesday night. Uptown Art is a great way to wind down any night of the week. You can practice your painting with your favorite bottle of wine at this BYOB establishment. Their helpful staff can be hands off or give you extra instruction depending on your needs. Van Gogh Vino, Paint your Pet, Mimosas & Monet. These are just a few of the art classes you’ll find at Carrie Curran Art Studios. This art studio is run by a mother daughter duo and focuses on instructional painting classes. You can bring your own food and drink while participating in their step-by-step painting courses. Carrie Curran offers fun painting classes for private events, girls’ night outs, and family art classes for a night out with the whole family. Uncork your inner artist at Brush & Bottle. No art experience is necessary to enjoy Brush & Bottles painting classes. They offer two and three-hour classes complete with artistic instructions and supplies. Make sure you bring your favorite bottle and appetizers to maximize your night of fun. Brush & Bottle is great for first timers and regulars alike. Long time regulars know about their punch card system. After every five visits your sixth visit is on the house. Date nights, birthday parties, or baby showers. No matter the occasion, Gogh Paint is the place to get creative on a night out on the west side of Phoenix. 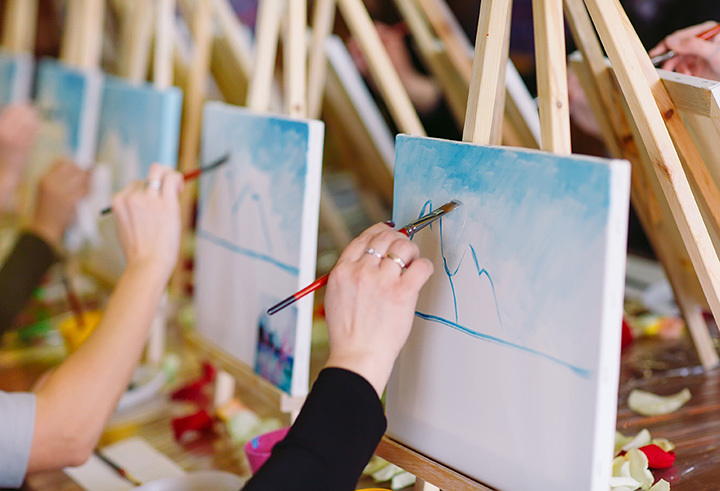 Bring wine to unleash your artistic abilities at this BYOB canvas painting class. Gogh Paint has a large, open space studio that can accommodate up to 40 people. They have wine glasses, corkscrews, and all the painting supplies necessary for a fun night out.